I had attended a discussion on “A World in Flux: The Atlantic Community, West Asia, Indo Pacific” at Brooking India available at https://strategicstudyindia.blogspot.in/2017/10/a-world-in-flux-atlantic-community-west.html. Dhruv Jaishankar, the moderator, subtly mentioned Jhon Mearsheimer theory on Europe. One had to see the reaction of Strobe Talbott, President of Brookings Institute. I being a “GD” person, my fauzi brethren will understand, thought of finding out John J. Mearsheimer theory on US Policy in Europe. Mearsheimer proposed the theory of offensive realism which describes the interaction between great powers as dominated by a rational desire to achieve hegemony in a world of insecurity and uncertainty regarding other states' intentions. He was a vocal opponent of the Iraq War in 2003 and was almost alone in opposing Ukraine's decision to give up its nuclear weapons in 1994 and predicted that, without a deterrent, they would face Russian aggression. His most controversial views concern alleged influence by interest groups over US government actions in the Middle East which he wrote about in The Israel Lobby and U.S. Foreign Policy. Mearsheimer asserts that China's rise will not be peaceful and that the U.S. will seek to contain China and prevent it from achieving regional hegemony. 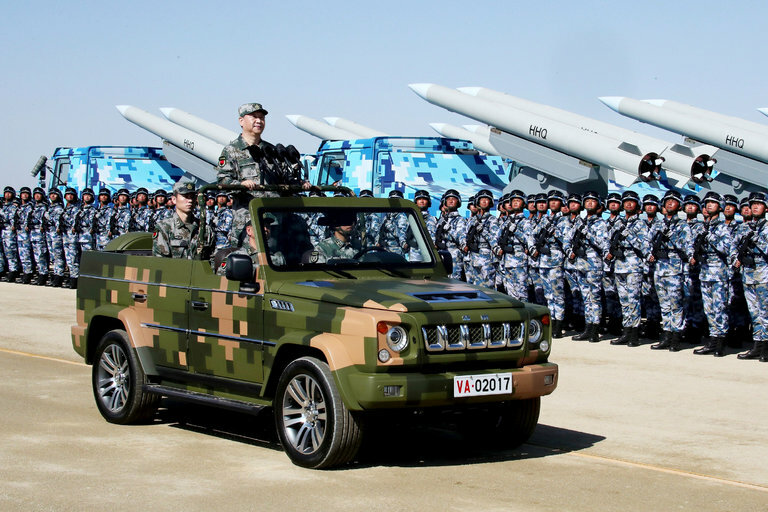 He believes that China will attempt to dominate the Asia-Pacific region just as, he asserts, the U.S. set out to dominate the western hemisphere. The motivation for doing so would be to gain a position of overwhelming security and superiority against its neighbors which it sees as potential challengers to its status. Additionally, he maintains that the U.S. will attempt to form a balancing coalition that consists primarily of India, Japan, the Philippines, South Korea, Vietnam and Indonesia to counter the growing strength and power projection capabilities of China. He points to increased alliances and warming U.S.–Vietnam and U.S.–India relations as evidence of this. After the break up of the Soviet Union, the new independent Ukraine had a large arsenal of nuclear weapons on its territory. However, in 1994 Ukraine agreed to give up nuclear arms, became a member of the Nuclear Nonproliferation Treaty, and within two years had removed all atomic weapons. Almost alone among observers, Mearsheimer was opposed to that decision because he saw a Ukraine without a nuclear deterrent as likely to be subjected to aggression by Russia. In September 2014 Mearsheimer wrote the article "Why the Ukraine Crisis Is the West’s Fault. The Liberal Delusions That Provoked Putin" published in Foreign Affairs. The essay was highly critical of American policy towards Russia since the conclusion of the Cold War. Mearsheimer argued that Russian intervention in Crimea and Ukraine had been motivated by what he saw as the irresponsible strategic objectives of NATO in Eastern Europe. He compared US-led NATO expansion into Eastern Europe and planned inclusion of Ukraine to the hypothetical scenario of a Chinese military alliance in North America, stating, "Imagine the American outrage if China built an impressive military alliance and tried to include Canada and Mexico." Mearsheimer argued that Russia's annexation of the Crimea was fueled by concerns that it would lose access to its Black Sea Fleet naval base at Sevastopol if Ukraine continued to move towards NATO and European integration. Mearsheimer concluded that US policy should shift towards recognising Ukraine as a buffer state between NATO and Russia rather than attempting to absorb Ukraine into NATO. Mearsheimer's article provoked Michael McFaul and Stephen Sestanovich to publish their response in November/December 2014 issue of Foreign Affairs. Between 1990 and 2008, all was well in Europe. That was because the West was not a serious threat to Russia. But, that situation began to change in 2008. First of all, there was the NATO summit in Bucharest in April 2008. At the end of that summit, NATO said in no uncertain terms that both Georgia and Ukraine would become part of NATO. The Russians, in response, made it perfectly clear at the time that this was unacceptable. And they made it clear they would go to great lengths to prevent that from happening. Nevertheless, NATO did not back off . Not surprisingly, in August 2008, you had a war between Georgia and Russia, which was in good part a result of the April 2008 decision to eventually include Ukraine and Georgia in NATO. The Georgians thought that NATO would back them if they got into a crisis or a conflict with the Russians. They of course were wrong; nevertheless, that was the first big piece of evidence that trouble was in store in Eastern Europe. What in particular has to be done? Ukraine has to be turned into a neutral buffer state. The West has to recognize that there is no way it can continue to pursue a set of policies that are designed to make Ukraine a Western bulwark on Russia’s border. The Russians will not tolerate this and will instead go to great lengths to wreck Ukraine to prevent it from becoming part of the West. This is what is going on now. Putin is basically telling the West they have two choices. Either they back off, or he will work to damage Ukraine so badly that it cannot join the West. If you want to end this crisis, and you care greatly about the Ukrainian people, and you don’t want to see their country destroyed, then it’s imperative that we back off and give up on the idea of making Ukraine part of the West. Instead, we must work to make Ukraine a neutral buffer state, which it was effectively between 1991 and 2014. I am talking here about returning to the status quo ante. I think it’s very unlikely this will happen. My bottom line is that we had an excellent situation with regard to European security before 2008. And we, meaning the West, blew it big time. No wonder Strobe Talbott saw red. I leave this to your judgment who is correct. However, I have the following points. Where are the International Theorists in India ? 70 years back we got independence we can’t hide behind stating that India is a nascent state. The vociferous academia from JNU and its ilk mostly educated in western renowned universities where they go very often have nothing to show about authoring any new theory. When we will get some theorist ? Our foreign policy practitioners from the IFS cadre have mostly no formal academic rigorous course/training, though they have the option to undergo high level courses in some of the finest universities of the world teaching International Relations. No wonder a large number of retired IFS fraternity who are present in all such discussion or write on these issues can’t answer the whys. They can only narrate what has happened. Can you imagine Indian Army War College Journal publishing a paper by a theorist of International Relations. I welcome some discussion on this issue. The solution they came up with was inspired by subway trains, whose carriages are connected by elastic joints. In the tunnel, Zhang said, flexible materials that were also waterproof and strong would be used to bind concrete pipes together when they passed through fault zones. The Yunnan tunnel and support facilities will take eight years to build at an estimated cost of 78 billion yuan (US$11.7 billion). It will carry more than three billion tonnes of water each year from northwestern Yunnan to the province’s dry centre and directly benefit more than 11 million people, according to the provincial government. The Yunnan Daily said the tunnel would create 3.4 million jobs, more than 30,000 hectares of new farmland and give the local economy a 330 billion yuan boost. Wang Wei, a researcher who helped draft the latest Tibet-Xinjiang water tunnel proposal, which was submitted to the central government in March, said more than 100 scientists formed different teams for the nationwide research effort. The team he was part of was led by China’s top tunnelling expert, Wang Mengshu. 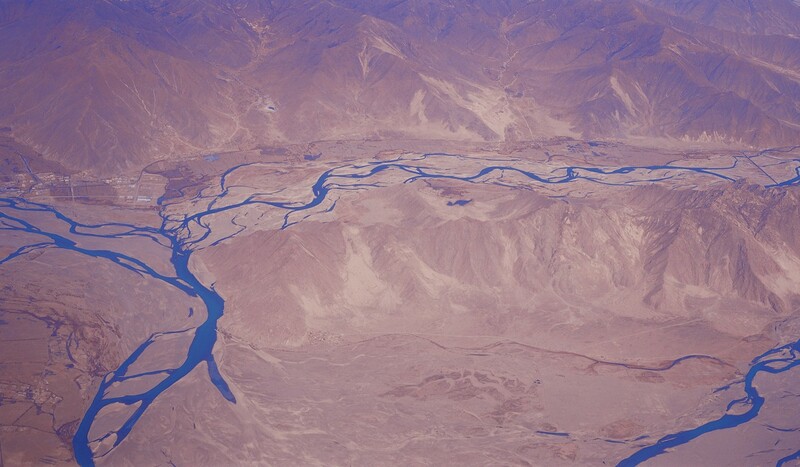 It suggested the government drain the Yarlung Tsangpo River at Sangri county in southern Tibet, near the disputed border with India. Sangri county featured a large, relatively flat valley that was ideal for the engineering project. An artificial island would be built in the middle of the river to create rapid turbulence, which could filter out sediment, and direct water to a well. The well could control the amount of water flowing into the tunnel. Wang, a researcher at the State Key Laboratory of Hydraulics and Mountain River Engineering at Sichuan University in Chengdu, said the tunnel would mostly be underground and would be built in many sections. In some places, large boring machines with drill heads around 15 metres wide would be lowered through wells to drill tunnels from opposite directions. Some of the drops involved would be so steep that the tunnel would be fitted with hydropower turbines to slow the water flow and avoid damage to lower sections. “No man-made structure can withstand the direct bombardment of water falling from 3,000 to 4,000 metres above,” Wang said. 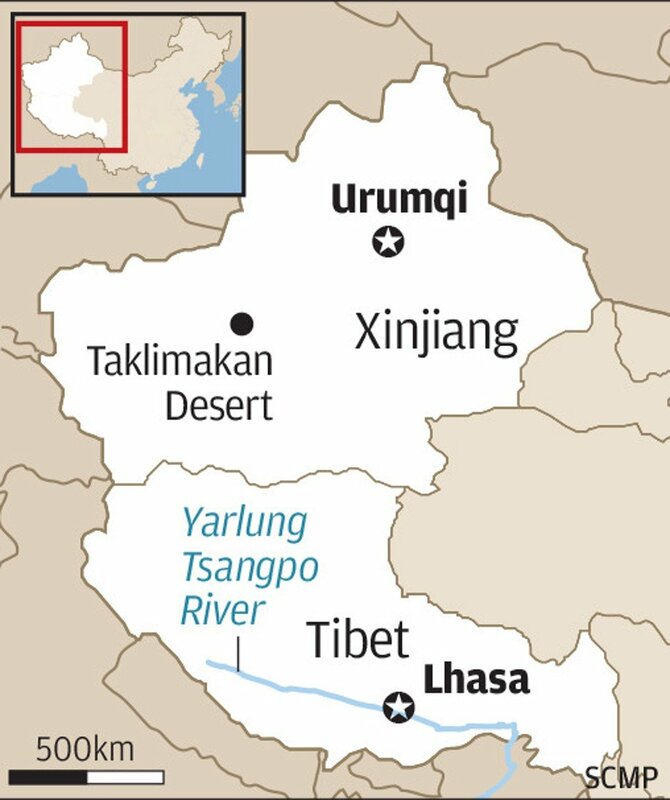 The researchers estimated the tunnel would be able to carry 10 billion to 15 billion tonnes of water from the Yarlung Tsangpo River to the Taklimakan Desert each year. That’s about a quarter of the annual flow of the Yellow River, the second longest river in China and the cradle of Chinese civilisation. But the cost would be astronomical. According to Wang’s estimate, each kilometre of tunnel would cost at least one billion yuan due to the difficult terrain and taxing altitude of the Tibetan Plateau. Wang said the project would also prompt protests from India and Bangladesh, which lay downstream. But compared to other proposals, which would require the construction of massive dams on the river, the underground tunnels would leave Tibet’s natural landscape largely unscathed. “It won’t leave a mark on the surface for other countries or environmental activists to point their fingers at,” he said. Zhang said China would definitely go ahead with the project one day. “In five to 10 years from now, the technology will be ready and the cost affordable, and the temptation of the benefits will be difficult to resist,” he said. Zhang said the water shortage in Xinjiang was in many ways similar to that in California early in the 20th century. The Central Valley Project, devised in 1933, diverted water from northern California to the San Joaquin Valley, turning it into the world’s most productive agricultural region. “With new water from Tibet, Xinjiang would boom like California,” he said. Zhou Shiqiao, a researcher at the Chinese Academy of Sciences’ Institute of Tibetan Plateau Research in Beijing, said the government should study the feasibility and environmental impact of the different proposals extensively before giving the final nod. The Tibetan Plateau, also known as the Third Pole, has been battered by climate change, with its glaciers shrinking and permafrost melting. Some studies have warned that Asia’s water tower might run dry if global temperatures continue to rise. The labs themselves are simple, tucked into nondescript huts or caves: a couple-dozen empty barrels for mixing, sacks or gallon jugs of precursor chemicals, piles of firewood, a press machine, a generator and a water pump with a long hose to draw from a nearby well. They are heroin refining operations, and the Afghan police and American Special Forces keep running into them all over Afghanistan this year. Officials and diplomats are increasingly worried that the labs’ proliferation is one of the most troubling turns yet in the long struggle to end the Taliban insurgency. U.S. Secretary of State Rex Tillerson said Wednesday that “too many terrorist organizations” find refuge in Pakistan and reiterated his call for the country to do more to address a rising problem of terrorism within its borders that, he said, threatens to destabilize Pakistan itself. “There are too many terrorist organizations that find a safe place in Pakistan from which to conduct their operations and attacks against other countries,” Tillerson said, speaking in India’s capital on the final stop of a tour through the Middle East and Asia. The terrorist groups’ growing strength and capability “can lead to a threat to Pakistan’s own stability,” Tillerson said. Afghan President Ashraf Ghani called on Pakistan to end its support to 'insurgent groups' and took a firm stand against joining the China-Pakistan Economic Corridor (CPEC), reported Tolo News. Ghani said he would not join CPEC if Islamabad refused to permit connectivity between India and Afghanistan. The just-concluded 19th Chinese Communist Party congress sanctioned president Xi Jinping’s centralisation of power by naming no clear successor to him and signalling the quiet demise of the collective leadership system that has governed China for more than a quarter century.By enshrining “Xi Jinping thoughts on Chinese-style socialism in a new era” in its constitution, the party has made this new “ideology” – just like Marxism-Leninism and Mao Zedong’s thoughts – compulsory learning for Chinese students at all levels. He is president, general secretary of the Communist Party and chairman of the Central Military Commission, to name a few. He leads working groups on issues as varied as Taiwan and internet security, and he has been hailed as the party’s “core leader.” Mr. Xi’s multiple designations reflect his status as one of China’s most influential modern leaders. On Wednesday, he gained another five-year term as the party’s general secretary and introduced a new leadership teamwith no clear successor, prompting speculation that he intends to rule beyond the customary second term. 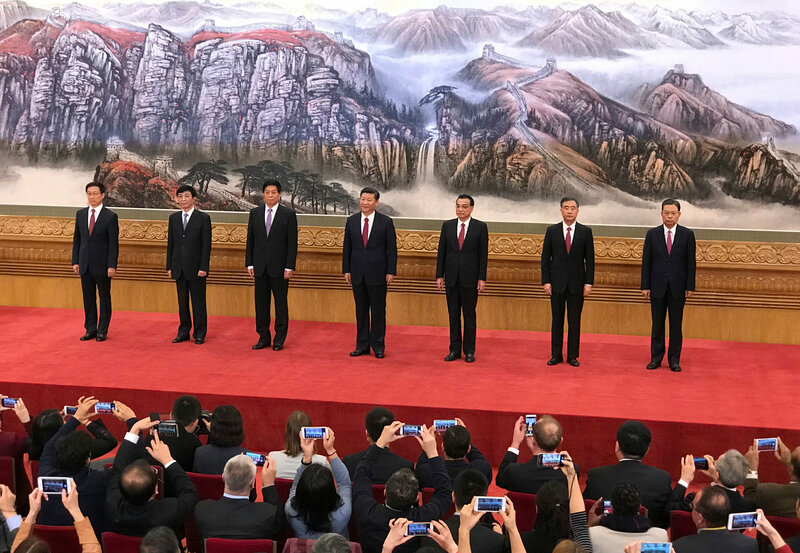 The six men, whom Mr. Xi presented before cameras in the Great Hall of the People, will join him on the Politburo Standing Committee, the Communist Party’s highest decision-making body. In addition to Mr. Xi and Premier Li Keqiang, who was already a member, the Standing Committee has added five new faces to help steer China as it seeks greater global influence. 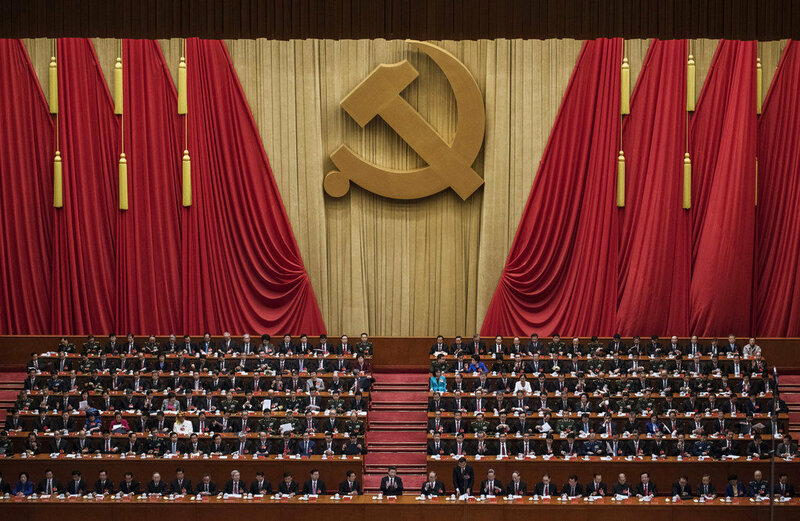 BEIJING — The ceremony in Beijing’s Great Hall of the People on Wednesday was meant to introduce the world to China’s new leaders, members of an elite committee that for decades has tried to govern by consensus and sometimes has been compared to a corporate board of directors. Instead, the nationally televised event was more a display of the political power that Xi Jinping has amassed in just five years as president. None of the other members of the new Politburo Standing Committee could be considered equals or potential rivals. The six men stood stiffly in dark suits on the stage, each bowing as Mr. Xi introduced them. One might expect President Donald Trump to take a victory lap after last week's liberation of Raqqa from the Islamic State. Thanks to American air power, Maoist Kurds, Syrian patriots and U.S. special operators, this caliphate ended as the shortest-lived in Islamic history. And yet the president chose not to exploit this win. The White House issued a five-paragraph statement. Much of last week was consumed with the president's feud over his phone call to the mother of one of the soldiers killed in Niger. Originally published by Alhurra ("The Free One") - A United States-based public Arabic-language satellite TV channel that broadcasts news and current affairs programming to audiences in the Middle East and North Africa. National Security Adviser Lieutenant General H.R. McMaster is a longtime Army officer who gained national attention for a book that criticized the military's leadership and strategy in the Vietnam War. Islamic State’s (IS) greatest conquest was its bold June 2014 seizure of Mosul, Iraq’s second largest city and home to approximately two million predominately Sunni inhabitants. For almost three years, IS dug in to defend this strategic stronghold and the site of the declaration of the IS khilafah (caliphate) by Abu Bakr al-Baghdadi, the self-styled “Caliph Ibrahim” (al-Jazeera, July 6, 2014). When a U.S.-backed coalition of jostling Kurdish Peshmerga, Iranian-backed Shia militias and Iraqi Security Forces made up of 114,000 troops launched “Operation We are Coming Nineveh” on October 16, 2016, they knew they were in for a bloody slog to dislodge IS fighters who had “worm-holed” the city, creating tunnels through buildings and building extensive defensive barricades. They were not mistaken in this assumption, and for nine months the allies battled their way first through modern east Mosul, then through the warrens of older west Mosul on the opposite side of the Tigris. 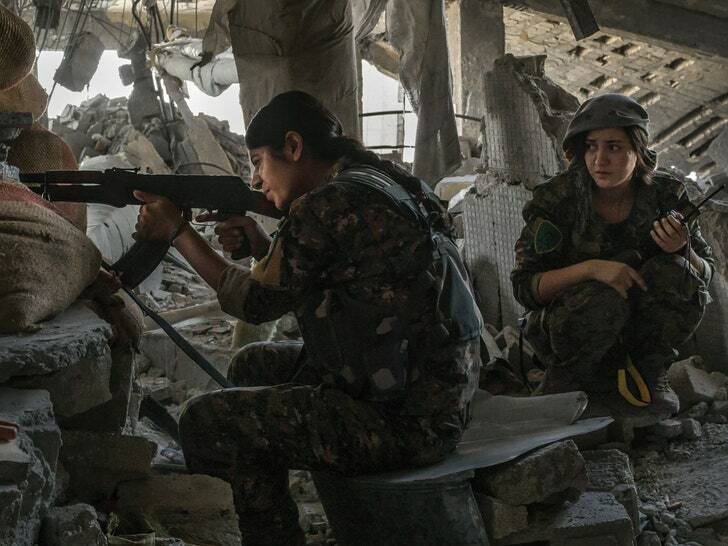 In August, in the living room of an abandoned house on the western outskirts of Raqqa, Syria, I met with Rojda Felat, one of four Kurdish commanders overseeing the campaign to wrest the city from the Islamic State, or isis. Wearing fatigues, a beaded head scarf, and turquoise socks, Felat sat cross-legged on the floor, eating a homemade meal that her mother had sent in a plastic container from Qamishli, four hours away, in the northeast of the country. In the kitchen, two young female fighters washed dishes and glanced surreptitiously at Felat with bright-eyed adoration. At forty years old, she affects a passive, stoic expression that transforms startlingly into one of unguarded felicity when she is amused—something that, while we spoke, happened often. She had reason to be in good spirits. Her forces had recently completed an encirclement of Raqqa, and victory appeared to be imminent. The world over, the topic of globalism rarely fails to elicit a strongly held opinion. At its extreme in Europe, the march of globalization is accepted as a near-inevitability: In that view, it is no longer merely a path that should be taken, but the inexorable destination of humanity. As such, there is little room for assessing, much less understanding, alternative perceptions about the structure of the world, either internationally or domestically. Whether talking with a German economist, a British investor or an expatriate businessman in Spain, there is a near-bewilderment as to why anyone would want to pursue nationalism over globalism. As such, the bump in popularity for the Alternative for Germany party, the independence referendum in Catalonia and the Brexit are all seen as anti-historical trends. To them, the European Union remains the moral and political compass for the world, the guiding principle upon which the nation-state will be subsumed and a new global society will emerge. Despite Western diplomatic efforts and sanctions against Russia, Moscow continues to attack and put pressure on the last vestiges of organized political and social opposition in Crimea, which Russia illegally annexed from Ukraine in early 2014. Indeed, September and October brought renewed persecution on the peninsula. The latest wave of harassment and intimidation began right after the opening of the Organization for Security and Cooperation in Europe’s (OSCE) annual Office for Democratic Institutions and Human Rights (ODIHR) conference in Warsaw. On September 13, Crimean Tatar Renat Paralamov was kidnapped by unidentified Russian authorities and, he says, severely beaten. However, thanks to international pressure, he was released the next day and found at a bus stop in Simferopol (Krymr.com, September 14)—the first instance, since 2014, that a disappeared individual in Crimea was found within 24 hours of having gone missing. Taking ownership of and “conquering” the Arctic are themes Russian authorities love to amplify. But sometimes, the harsh Northern reality interferes. The crash of an Mi-8 helicopter in Svalbard (Spitsbergen), last Thursday (October 26), with eight lives lost, was one such occasion. Norway launched a rescue operation within 30 minutes, while Russian officials continued to falter for hours about the unclear circumstances surrounding the incident; the Russian search party arrived only on Sunday (RBC, October 26; RIA Novosti, October 29). Summary: Immigration and loss of confidence in its culture and values. Either is survivable for Europe as a society. The combination might not be. Here is the Introduction from The Strange Death of Europe, a controversial book about one of the great stories of our time. This is the second in a series about this book. Europe is committing suicide. Or at least its leaders have decided to commit suicide. Whether the European people choose to go along with this is, naturally, another matter. When I say that Europe is in the process of killing itself, I do not mean that the burden of European Commission regulation has become overbearing or that the European Convention on Human Rights has not done enough to satisfy the demands of a particular community. As forces become more connected, are they becoming more vulnerable? The internet of things has transformed industries by providing the ability to quickly collect data and interconnect multiple nodes of data input seamlessly. 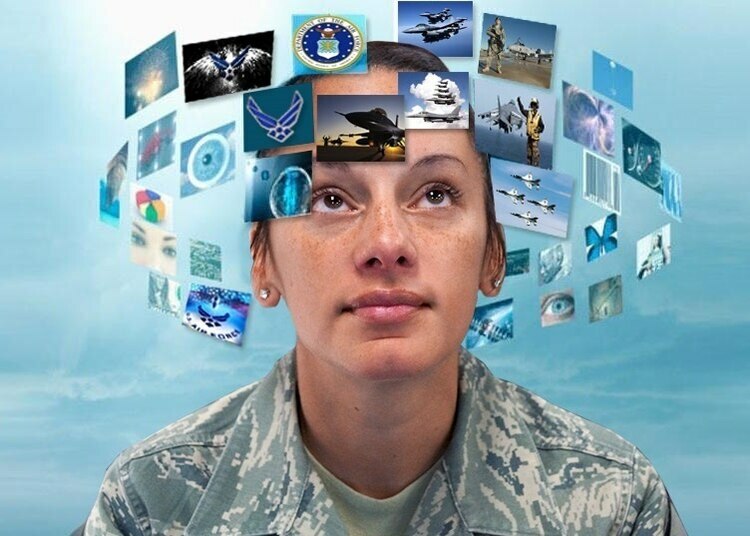 IoT is doing the same for the military, providing greater access to essential information and helping soldiers make decisions faster. But despite all its benefits, IoT comes with its own set of security risks. Discord is a niche social media platform used by the video gaming community to organize strategies for competing in massive multiplayer online worlds. It has also been used by the extreme Right to plan international revolution. Extremist discussions on Discord are hard to penetrate. During September’s German election, for example, anyone wanting to join the Infokrieg or Reconquista Germanica groups was vetted through several layers of interviews and social media background checks to weed out spies from true believers. Researchers from the counter-extremism NGO Institute for Strategic Dialogue managed to infiltrate the sites however, and, as their report (which is to be released next week) details, they discovered an impressive, international psy-ops operation aimed at helping the right-wing Alternative Fūr Deutschland (AfD) make it into the Bundestag for the first time.